The food that is given to the patients in the hospitals go through rigorous quality checks. They also have to properly plan the recipe of the food so that each patient is able to get the nutrition that he or she requires. Though the food that is to be served in the hospitals have to be high quality but the food has to be within a certain budget. There are certainly computing services that help these hospitals serve good food within the right budget. These computing solutions also minimize the amount of food wastage. So it is important that you hire the services of a company that makes use of the best and the latest hospital kitchen equipment. This will provide the patients with the best care at minimum cost. 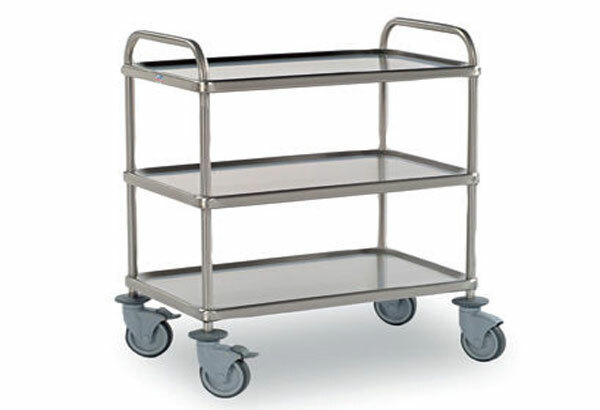 We are engaged in the sphere of manufacturing and exporting a wide range of trolleys such as Kitchen Utility Trolley, Room Service Trolley, Linen Trolley and Luggage Trolley. These are manufactured with high quality raw material to ensure sturdiness and durability. 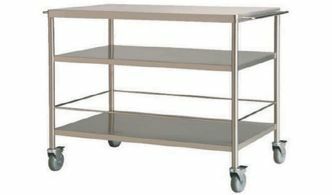 Available in various sizes, our trolleys can also be customized as per the specifications, provided by our clients. Traditionally it has been observed that the quality of food in the hospitals is not very good. However, these days the hospitals have realized the importance of nutritious food. The people who are sick mostly face a loss of appetite. So in order to regain their lost appetite it is important for them to have healthy food. A body that is under nourished has defense mechanism that is significantly lowered. So if the quality of the food is bad then there is a high possibility that the patients might suffer from certain diseases. If the person suffers from certain health related problems then the immune system do not function in the way that it should. Correct nutrition is the most important medicine for the patients. It is in these steam cookers that vegetables and fishes are cooked retaining the important nutrients and removing the fat content in these foods. The food cooked in these cookers also retains the freshness. Different classes of foods are prepared in these mixed ovens. Here you are able to cook a number of rations at one time. You can cook very large quantities of food in these fryers by scheduling the temperatures and the times properly. When you are responsible for the department of food in the hospitals it is very important that you get the right equipment. This will ensure that you are able to provide the patients with good quality food at a reasonable price. If you do not have the right equipment then there are chances that you will not be able to prepare the food within the scheduled time. The patients not only need good quality food but they also need eat that food in the right time. The right equipment will help you to prepare food fast and also retain the essential nutrients. In the hospitals you have to prepare food in huge quantities. As a result you not only have to maintain the quality but also have to prepare huge quantities of food. This food has to be prepared fast. You can do all this only and only if you buy the right kind of hospital equipment.